Beautifully balanced sweet and sour with soft, tender pork and textured cabbage and a salty jus. Comfort eating kept primal. It's not a cheat ... it's a treat! Eat and enjoy. Simple, foolproof cheesecake with the punch of frozen berries. Perfect mid-winter joy! I've made this before a number of times and it fast becoming one of my favourite quick mid-week meals. Quick? Yes, 30 minutes, all done and activity all the way through. I could probably shave it to 25, or even 20 minutes, but resting meat before slicing is always a good thing, so it's 30 minutes. Oven on. 200C/400F. Kettle boiling. Pork tenderloin - about a foot long, so cut in half to make it more manageable. Cocquina squash - a squash variety which has a more crumbly texture than my usual butternut. Bramley apple - the staple British cooking apple. It's quite tart so we'll round that off with some honey and butter later on. Jus - we'll make a quick jus (posh word for thin gravy) from the roasting juices later on using some chicken stock, onions and garlic. Sage, too, for perfume. Greens - savoy cabbage, today. Something green, anyway, whatever you fancy. Fats - butter and goose fat. You could easily use coconut oil, lard, dripping, whatever your favourite fat. Pop an oven-proof tray into the oven with some cooking fat to melt. I used goose fat. While it's melting, peel and slice the squash, cutting each slice in half to match the shape and size of the apple segments. Arrange the squash pieces in the tray and pop it back into the oven. This will want the full 30 minutes, so this is done first. More goose fat in a skillet and start to brown off the pork. We'll be keeping it on the stove for about 10 minutes, then transferring to the oven for another 10, then resting for 10. The meat needs the 30 minutes. Peel and core the apple, cutting into generous segments. Snip the stalky bits out of the savoy cabbage, shred and get it steaming. Other greens may take less time so, depending upon your choice, start this off later on. Peel and slice an onion, get it softening in a little butter in a sauce pan. Turn the pork onto each side and ensure that it's coloured all round. Pop the pork into the oven. If you don't have an oven-proof skillet, simply transfer to an oven-proof dish but keep the frying pan - we want that flavour! Add some crushed garlic and sage to the softening onions and pour on some chicken stock. Let it sit like this extracting the flavour into the stock. Pour yourself a pre-dinner drink. 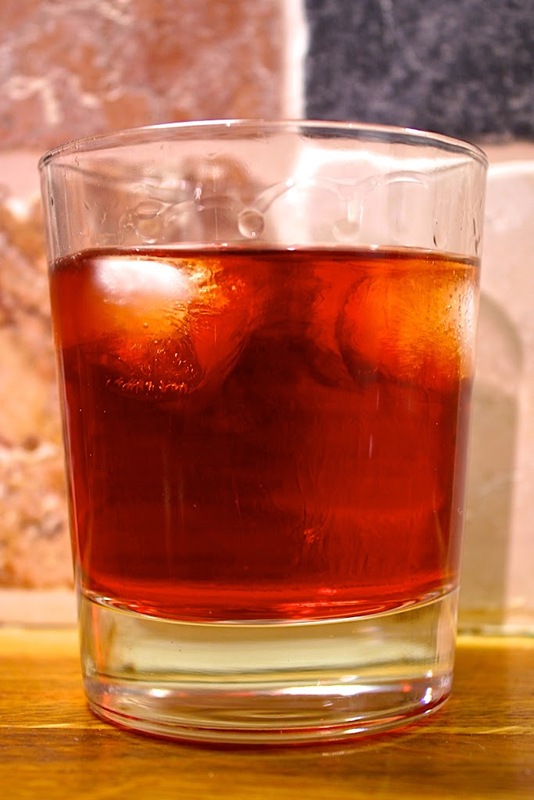 I went with a Negroni - equal parts Campari, gin and Red Vermouth. Remove the pork from the oven, place in tin foil and set to rest. Deglaze the skillet with the chicken stock, scraping all the flavour into the gravy. Pour back into the pan. With the skillet cleaned, melt some butter and just a little honey. Place the apple segments into the skillet and gently fry them off - the butter and honey will work with the tartness in the apple, rounding it off without killing it off. Strain the gravy and whisk in some butter - this will thicken it and give it a glossy sheen. Heat off, let it sit. Arrange the squash and apple around the plate, alternating. Mound the cabbage in the middle. Add any last drops of pork juice into the jus and pour over the jus forming a lake on the plate. Slice the pork on a jaunty angle and lay over the cabbage. Garnish with chives and freshly milled black pepper. Present at the table, eat, enjoy, go about your evening. ... a simple medley of complimentary ingredients. I have a glut of tenderstem broccoli, which I love for lunch alongside whatever leftovers I have. For whatever reason, I've not been eating it, so ... how to use it up? First, get some eggs boiling. I know boiled eggs are not the first thing you reach for when doing a stir fry, but everything is better with an egg on top, isn't it? Prawns - I used both the small and larger, more plump prawns. I think, although I may be entirely wrong, the smaller ones are polar and the larger, more tropical. Anyway, some prawns. Vegetables. Tenderstem broccoli - snip off excess stalk and reserve for a soup later. Carrots - peel and slice into ribbons. Flavours - spring onion, garlic, ginger, chilli (powder and whole) and coriander (ground and fresh). Large frying pan and some of your favourite cooking fat - I used coconut oil. In go the prawns, dance them about a little and put them aside. Yes, remove from the pan and set them aside. Why not just toss them in at the end? Well, they release water which we don't want in the stir fry - easier to cook them through, get the water out and then proceed with the rest of the dish adding them in again at the end. Next, the broccoli (with more coconut oil) and keep it dancing around to cook through yet remain crunchy. In with the flavours - chilli powder, some ground coriander, ginger, garlic and the whiter part of shredded spring onions. Keep the green parts for later. Also, some of the chopped coriander - I chop it in such a way as the stalky part is finely chopped, then chop gradually larger towards the top, reserving the loose tops for garnish. Toss the prawns back in and the carrot ribbons - these will cook through in no time and potentially lose their crunch, so keep it quick here. Out onto a plate, sprinkle over the green parts of the spring onion, shredded chillies and the coriander leaves. Top with egg halves. Spicy and crunchy ... just a perfect simple stir-fry. Take an ingredient, cook it, blend it and you're done. Vary by adding in a second ingredient or spices, or better still, some meat or fish. Gluts of seasonal vegetables can be enjoyed with a bountiful variety. I have some brisket left over from Sunday Dinner and I have a glut of parsnip. Soften some onion in butter, adding in spices - turmeric, coriander, fenugreek, asafoetida, ginger and garlic. Peel and cube a large parsnip, tossing in the butter before adding in stock. Chicken stock is good - it's light in flavour, but vegetable stock would do fine. Once the parsnip is soft, blend to a purée. Adjust flavour and consistency with a little more water and sea salt where necessary. Prior to serving, stir in some spinach and serve with shredded brisket dropped in the middle. I am not at all au fait with Thai food, so please excuse me if I completely misunderstood this ... I hope I got it right. If not, I've come up with something quite wonderful! I have had it in mind to do something with minced meat and prawns for some time. The idea sat on a back-burner for a while and with revived interest set about reading up on how to make something really tasty based around that idea. One thing led to another and I found a dish called Laab. Thai, also Lao, Laab is a simple meat and rice dish served with a salad. There appears to be little by way of a "standard", so I just thought ... what the hell ... I'll use what I want to use and spice it up. Looking at all manner of recipes, the spicing appears simple: chilli; flavour enhancement: fish sauce. I went with minced turkey breast, fancying something a little different, boosted with some prawns, filled out with shredded spring onions and cucumber, then just the fish sauce, chilli, garlic, ginger, squeeze of lime and fresh coriander. Cook off the mince in a large skillet, oiled with a little coconut oil. Once cooked through and with a nice grainy texture, add in some prawns and some fish sauce. Don't over-do it, though - fish sauce is salty! Once the prawns are warmed through, add in the spiciness: ginger, garlic, spring onions and chilli. Shred up some spring onions and fine dice some cucumber. The cucumber was in there as a feint attempt to bring the saltiness down a little; I perhaps over-did the fish sauce or maybe the primal palate is not used to it. Serve out with some lettuce leaves having given the food a squeeze of lime juice and a garnish of fresh coriander. Laab is often served with rice. While this is perfectly primal, it wasn't necessary for us today. Maybe another time. In fact, considering the word "authentic" ... can it ever be applied to cuisine? One may have an authentic painting or an authentic first edition book, but cooking? As with all traditional recipes, nobody really knows where they started, what they looked like when they were first put together or just how much they have evolved or changed since then ... that evolution is actually the process that creates a refined and defined dish which becomes celebrated and so: authentic. It is because the idea has travelled around the world, been re-interpreted, tried and tested by people outside of the original ethnic group that a dish becomes so great. I cook us Chilli every week for our Friday night "kick back and relax" meal after a hard week of work, recognising that we did our thing and we did it well ... and now it's time to really enjoy the weekend break. Since going paleo, I've left out the beans - granted, that is not "authentic" but then I was cooking a Chilli Con Carne, not a Chili. I've substituted them with all manner of good things, picking a seasonal veggie and dropping it in, cubed - this keeps my Chilli fresh, interesting and always different. Tonight, I was after purity ... a really refined version. I decided to go with a smoky flavour and so, the Chipotle is the main chilli in here, boosted with chocolate and smoked sea salt. I also like my Chilli hot, so in goes a dried (and smoked?) Scotch Bonnet! Whoa! This was hot! I also looked further into oregano. Mexican oregano is an entirely different herb/plant to European oregano, but, as far as I can tell, the Mexicans called their plant "oregano" because it had a similar flavour to European oregano. In fact, I understand that it is more like marjoram, and I did find an Oaxacan Chef who uses marjoram in preference to Mexican oregano. The flavour of Mexican oregano is further, more earthy, quite intoxicating in scent, carried by an almost mint-like compound, even slightly citrussy. My herb blend was dried marjoram, fresh mint and some lemon peel. Minced beef, beef dripping, chopped tomatoes, tomato purée, red onion, onion, garlic, ginger, Chipotle chilli, beef stock, black pepper, smoked sea salt, chocolate, marjoram, mint, lemon peel and jalapeno chillies. First, brown off the minced beef in a skillet with some beef dripping. No, coconut oil will not do! The ingredients have been very specifically chosen. Beef dripping, it is. As the mince browns, keep breaking it up and try to grind it further to a really fine texture. For two people, I find a pound of meat is good. This is about half a kilo, if that's your scale of measurement. Meanwhile, take half a red onion and half a regular onion, chop roughly and place into a receptacle suitable for blending along with some cloves of garlic, a good teaspoon on fresh ginger and some pre-soaked dried Chipotle and Scotch Bonnet chillies. Blend the lot together and add the chilli water. Pour this paste into the now browned minced beef and cook through. Add in a good squirt of tomato purée, some black pepper and beef stock. Stir together. Pour in a carton of chopped tomatoes and stir in. Add the herbs: sprinkle over dried marjoram and a couple of leaves of well chopped fresh mint along with a piece of lemon peel. Place a couple of squares of high content chocolate in the middle and cook on, gently for a couple of hours, topping up with water as necessary. Towards the end of cooking, check tastes and adjust accordingly - salt, or more chilli, where necessary. Serve out with some fresh chilli de-seeded, halved longways and sliced as garnish. Accompany with a chopped salad of red cos, giving an interested red/green base, cucumber, tomato and radish; guacamole and Greek yoghurt alongside. Grab a bottle of your favourite red to put out the fire and kick back for the evening. Begin with some coconut oil in a large skillet and get a large onion, quite roughly chopped, softening. Add in some chunks of turkey meat and ensure it is all browned. Add in some cubed sweet potato. In with some garlic, ginger, turmeric, ground coriander and black pepper. Stir in a carton of chopped tomatoes, a good squirt of tomato puree to thicken and top up with chicken stock. Let it simmer for about 20 minutes, by which time the turkey will be well cooked, the sweet potato will be softened and the liquid reduced. For a further 10 minutes, just to finally reduce, add in something green - spinach would be great, but I didn't have any, so in with some chopped kale. I also added some chopped celery, fresh chillies, more black pepper and some smoked sea salt. Hungry? Serve out into a wide brimmed bowl, egg on top cut in half and some fresh coriander to garnish. Sit back in front of a roaring fire and enjoy! Chilean Merlot was the choice of drink. If there's an envelope to push, you know I'm going to push it ... Lasagne, anyone? Okay, so what the heck is primal about Lasagne, eh? Well, nothing, especially not since primal is most certainly not about emulating neolithic foods with alternative ingredients - that's just gluten-free. Whenever I see recipes that emulate neolithic meals that are presented by simple placing the word "Paleo" or "Primal" up front, it gives me a smile - a smile is not a bad thing; a sneer is. I smile. I smile because they do it, I do it, we all do it. To some extent, all so-called Primal cooking is quite neolithic in itself. Substituting ingredients that are negative to our health with ingredients which are not is eminently primal ... and a good thing to do. I hope you had a laugh ... L&H are quite probably the absolute genesis of film comedy. Whatever they do is funny ... everything after is a copy of these guys' comedy genius. Stanley is a northern Brit, don't you know. I also smile because this kind of food is quite often comfort food - it should make us smile. Tonight, cold, snowing and next to a warming fire, a plate of comforting Lasagne with a glass of nice Chilean Merlot is just the ticket. We should take time to smile. I have read, although I am hazy about the reality of it, that when we smile, our brains release happiness into our system. It's a nice thought. The filling is a simple ragu of minced beef, onion, garlic, celery, carrot and mushroom in a chopped tomato, puree and beef stock sauce. Slow-cooked for three hours, reduced, perfect! The cheese sauce is cheddar - medium and mature, mixed, in a mixture of half cow cream and half goat milk. Reduce until thickened. The "pasta" is a manioc pancake - a cup of manioc flour (Brazilian sour starch, as I buy it), half a cup of finely grated pecorino, a sheep cheese, four eggs and an inch off a stick of goat butter, melted. This made me three large (12") pancakes, nice and thick, too, so three layers in the lasagne ("thryse" in our Old English tongue). You can make these up while the cheese sauce is reducing and thickening. Don't be tempted to use arrowroot in a dairy sauce - it will look disgusting! Ready to put it together? In a 12" square dish, some cheese sauce, some ragu, a pancake and then repeat two more times. More cheese sauce over the top and some fresh herbs. Pop it in the oven for about 15 minutes until crispy and brown on top, then serve out. Of course, if you have a different shaped dish, perhaps oval, make smaller pancakes and put two side by side to fill the shape. Better than pasta-based Lasagne? Not 'arf! The Taco part is easy ... Gem Lettuce. First, a salsa of sorts. Take a green pepper, tomato, onion, garlic, ginger and chilli, and blend the lot. Sieve it. Shake the sieve to release more liquid; the more the better. The salsa should be quite dry, but the liquid is important. The released liquid should be joined by a good squeeze of lime juice. Drop the fish in - I used Pollock, a white Atlantic fish, filleted and cut into small chucks. Allow the fish to marinate for a good hour. I also made up a Holy Guacamole. Holy? Indeed, it's so pure - just the avocado, blended well. In a hot skillet and a good amount of coconut oil, fry off the fish and some prawns. The liquid should have been drained, but some in the pan is not a bad thing - it will evaporate and add to the flavour. While in the pan, sprinkle over some paprika, cayenne pepper and a little black pepper. See! No need to flour the fish. No need at all. Once cooked, fish in a bowl, garnished with fresh coriander and a slice of lime, lettuce on a plate and the salsa and guac alongside. That's it - the ratio between cream cheese and cream is 2:1, whatever cream you end up using, be it cream, soured cream or even yoghurt as a substitute. Whisk until firm, spoon into forming rings, push some berries into the top and settle in the fridge to set and chill. Our American friends call this 'Kale Chips' but I'm calling it Kale Crisp, since we call "chips ... crisps" and "fries ... chips" and this is not really crisps, either but just crisp. Take all the stalky bits of the kale, spread it out on an ovenproof tray, drizzle of olive oil and some sea salt. Into the oven at 200C for 10-15 minutes, keeping an eye on it and retrieving it once it has gone crisp, but before it really starts to brown. Great as part of a meal and fun to just eat while watching a film, or something. My Farm Shop had the most gorgeous looking peppers (capsicum in American English?) and I got carried away ... I bought too many, hence this is the second of two stuffed pepper dishes. This is also a leftovers dish, bulking out some leftover Fish Chilli from Friday. First, get the oven on, set to 200C. Cut up a sweet potato to make chips, or fries, if you prefer by laying them on an ovenproof tray with coconut oil, turning every so often. This will take about 30 minutes. Prepare the green peppers by cutting in half and scooping out the middles. Pop them into the oven for about 20 minutes at 200C to cook through and soften. Fish Chilli was made up from onion, garlic, ginger, chilli, chopped tomatoes, cayenne pepper, paprika, ground coriander, oregano and fish: pollock. With the little bit left, I added in some cubed courgette, a good handful of prawns, some more chilli, forgot what I'd done and added yet more chilli! Wowzers! This was a hot one! With the peppers ready, it's just a case of stuffing 'em, topping with some mozzarella and returning to the oven for a few minutes to melt the cheese. Dairy not your thing? Leave it out. Sprinkle some fresh herbs over ... parsley would be perfect. This mozzarella was from buffalo milk, a dairy which is significantly lower in the allergenic and seemingly quite destructive alpha S1 casein. Not only is it a better choice than cow milk cheeses, but I think, a good choice, since the complexes within buffalo milk, like goat, are quite beneficial to humans. Ready? Serve out, scattering the sweet potato chips over the top and some leftover pico de gallo around. Another great mid-winter dish of flu-busting goodness! Communities on G+ has taken off and there is renewed talk of Pizza on the primal and paleo communities. Aubergine as the base, sliced through and griddled, topped with pepperoni and buffalo mozzarella. Buffalo milk has dramatically lower levels of the allergenic and downright nasty alpha S1 casein compared to cow milk. It's a good choice if you are happy with some dairy in your ancestral template. No tomato? Nah, I didn't fancy it but might well next time. Pepperoni? Yeah, I know ... what can you do? It was fun. It'll probably be another year before I so it, or something similar, again. Braising beef is tough and likes to be just left to slow cook. Braising beef steak is simply a steak of braising beef and should be treated exactly as you would diced braising beef. Take a lidded oven-proof dish and line the base with shredded onion and some minced garlic. Brown off the steaks on the hob and transfer to the dish. Fresh thyme, a bay leaf and some beef stock over ... into the oven set low, like 140C, for 2-3 hours, more if you want, but lower the heat. For the last hour, remove the lid so that the gravy can reduce and consolidate. Retrieve the steak carefully - it will transfer to the plate in one piece, like a steak, so long as you're careful but remember, this meat has slow cooked and it will be soft and tender. Blend up the gravy so that all the onion and herb goodness is incorporated in and then strain to remove excess solids. Whisk in some butter to give it a sheen and slick thickness. Serve with some veggies. We had mashed potato and some delicious kale, which was so soft and dense, almost like a kale duvet. Classic! Although no gravy ... but chestnut mushrooms alongside. Liver is a fantastic offal, full of all manner of goodness, but most importantly, a great pack of vitamin A. While it is suggested that one errs on the shy side of vitamin A consumption, I'm not sure you can really have too much of a good thing. As with all things truly paleo, don't weigh it, don't measure it, eat it, enjoy it ... don't worry. First, the onion, which just wants shredding and softened over a low heat with some butter, coconut oil or your favourite cooking fat until they begin to brown and caramelise. At this point just scrape them to the side of the skillet and fry off a few mushrooms. I went with large chestnut mushrooms which I found at my local Farm Shop, large, almost portabello in size, so sliced through and cooked off in more butter, turned to soak up all the fatty goodness. Serve out the onions and mushrooms onto a plate and then, raise the heat under the skillet, settling in a few slices of liver. This will cook through quickly, certainly before the onions have time to cool. Turn the liver once one side is done, giving each side a final flash at the end. Serve over the onions and mushroom, garnishing with fresh herbs: parsley, in my case. For a really sumptuous dish, pour some thick gravy over, then garnish. Either way, what a perfect breakfast! And, what a fantastic day - cold, bright and just right for a great walk. My Farm Shop had the most gorgeous looking peppers (capsicum in American English?) and I got carried away ... I bought too many, hence this is the first of two stuffed pepper dishes. These are stuffed, simply with beef mince. The beef mince is simply prepared, based on softened onions in beef dripping, some garlic, then the minced meat, beef stock and tomato purée then settled on a low heat for a couple of hours. When ready to eat, cut the peppers in half, scoop out the middles and pop them into the oven for about 20 minutes at 200C to cook through and soften. Fill 'em up, top with cheese and return to the oven for the cheese to melt. Serve out with a glob of soured cream on top. Dairy not float your paleo boat? Leave it out. This is a fine meal as just minced beef stuffed peppers. Yes, that's Fries, French Fries or Pommes Frites in other popular languages - the key difference is, the English Chipped Potato (Chip) is cut much thicker than its European and North American counterparts. Chips represent a huge pack of carbohydrate and fat energy with a potentially high glycemic load ... unless they're eaten with fat. Simply put, fat slows the digestive process dramatically lowering the glycemic load. Want to know more? Check out J Stanton's article on Fat and the Glycemic Index: The Myth of Complex Carbohydrates. Peel and slice up a good sized potato per person into thick chips. Par boil by placing into cold water and raising the water to the boil. As soon as the water begins to boil, drain and set the chips out to steam off - we want them dry, so pat them with a kitchen towel, too. In a large skillet, soften a good helping of goose fat. Goose fat is perfect for frying, with a high smoke point and a great flavour. Normally, chips are deep fried - I'm shallow frying them here (hence, the redux) so they're more like sauté potatoes, but still have that outside crunch and powder softness in the middle. And, these are more fun - they're crinkle cut! Possibly not Swedish at all, but I got the inspiration for a creamy salmon soup from an excellent Modern Swedish Cuisine book I have. I love reading cook books, rarely following any of the methods or even recipes, but I get a lot of inspiration - the reason I don't post with the traditional recipe and method combination is, I hope to inspire, not to instruct. So, this 'ere stew ... how? We're going to drop all manner of seafood goodies into a broth of vegetables. In a wide skillet, get some chopped onions softening in a little butter. Make up a fish stock however it is that you do. I reserve all manner of heads and tail to boil up and keep a reduced stock in the freezer. I say that, but this time, it was a stock cube. Pour the stock into the skillet. Slice some carrot and potato, get them boiling in the stock. Once softened, add in some peas and asparagus. Drop in whatever you want, but certainly salmon - a good fillet cut into large cubes. I got a wonderful piece of salmon just before Christmas and it's been sitting in my freezer waiting for a meal like this. I also had some mussels, scallops and prawns, so these went in along with the salmon. Watch the dish! We don't want things over-cooking, so once the salmon has gone fully opaque and just started to open, it's time to finish up the dish. Sprinkle over some turmeric and ground coriander, along with some black pepper. Ensure that the spices are combined. The stock will, by now, be quite reduced and concentrated. Pour in a little full fat cream just go opaque. Cream helps to offset saltiness and lend a deep, sumptuous and warming character to the stew. The steak and the chips speak for themselves, but what is samphire? Beginning their growth season in the autumn and continuing through the winter until the start of the warm season, whether sautéed, steamed or blanched, samphire is perfectly seasonal and such a treat for eating with simple seafood. First, the chips ... peel and slice up a good sized potato per person into thick chips. Normally, chips are deep fried - I'm shallow frying them here so they're more like sauté potatoes, but still have that outside crunch and powder softness in the middle. Meanwhile, fry the steak - I set mine on a cast iron griddle pan, turning after a couple of minutes. I like my steak rare. Just before serving, immerse the samphire in boiling water and remove immediately, drained and onto a plate, accompanied with the steak and chips. What a meal! Right ... time to go ... I'm Fencing tonight. ... yet more of those damn sprouts to use up! Thankfully, this is the last of the Christmas sprouts - they are gorgeous, but you can have too much of a good thing. We'll give it a break for a while. That's the sprouts, what are Hasselbäck potatoes? Simple - they're just roast potatoes done a little differently, Hasselbäckspotatis in Swedish, from the Hasselbäcken restaurant in Stockholm. First, the potatoes and the onion since these are going to take the longest to roast - set aside an hour for the cooking. The onion is easy - simply cut in half, sandwich a good slice of butter in the middle, wrap tightly in tin foil and bung it in the oven set to 200C for the hour. Toss in a dish of goose fat as well, to warm through. Meanwhile, prepare the potatoes. Peel and half a number of medium sides potatoes. Lay a couple of spoons, chopsticks or whatever you have to have down on the chopping board and place each potato in turn between the sticks. This is so that when the cut through the potato it does not cut all the way through. Slice each potato through, down to the chopsticks, about a millimetre or so apart. As they bake, they will open up. For a neat twist on this, cut also longways to make a hedgehog! Retrieve the dish of goose fat from the oven and place the potatoes in, spooning over the fat to get the cooking started. In they go, 50 minutes will do fine. So, about half an hour from the end, get the pork started. I had a loin about a foot in length, so cut in half and browned off in a skillet on the hob for maybe 10 minutes in total, turning when necessary. Place a good few sage leaves between the two pieces and put the skillet into the oven ... we've 20 minutes to go, but we'll want to get the pork out in 10-15 minutes. After 10-15 minutes, retrieve the skillet with the pork. Careful! Hot! Cover with foil and set aside to rest. Meanwhile, the sprouts. Cut the bottoms off the sprouts and remove some of the more bitter outer leaves. There is no need to mark an X in the bottom of each - this serves no purpose in my mind, if anything leaving the sprouts too cooked. We want crunch! Boil for 5-10 minutes. Now, the jus - take the pork out of the skillet and place the skillet back on the hob. Add butter and whisk like the clappers with a little white wine. Get all those pork and sage flavours released and into the liquid. Set to reduce, then strain. That's your jus. Cut the pork into slices just shy of an inch each, arrange around the plate, likewise, the potatoes and the sprouts. Place the onion alongside and spoon the jus over. Christmas, certainly here in the UK, seems more a celebration of Brussels sprouts than it does the birth of Our Lord! We go crazy for these things ... overbuying, and often having to throw out the surplus when they get past their best. There are more than a few things that you can do with a glut of food - the first, and most obvious, is soup; the second, simply celebrate the glut by making up a huge plate of them! Starting with the Brussels sprouts, let's just have a think around what goes well with strong green vegetables. Well, they like something meaty and salty: Chorizo is perfect! Cod goes well with chorizo, so we've got our protein and fat sorted. Anything else? Well, black pepper, some herbs: chives, in this case, chestnuts, simply because we only have them at Christmas to eat with sprouts and again, buy too many, some mashed potato to bulk out the meal and finally, some chilli over the top because chilli makes everything better. Begin by peeling and boiling a couple of large potatoes, one per person. While they're boiling, cut off the bottoms of the sprouts and remove some of the more bitter outer leaves. There is no need to mark an X in the bottom of each - this serves no purpose in my mind, if anything leaving the sprouts too cooked. We want crunch! Over the sprouts, steam some cod. In a large skillet, begin with some goose fat (which is also something which seems to be bought only at Christmas, but I will be continuing with this as my primary cooking fat since it is both delicious and seriously healthy) ... where was I? Fry off some cubes of chorizo, chopped onion and garlic. Drop the chestnuts into the skillet and continue to fry the mixture. Drain the sprouts and add to the skillet. Drain the potatoes, mash with butter and place a mound in the middle of each bowl. Flake the fish into the skillet and give the whole lot a good toss through, finally adding in the black pepper and shredded chilli. Serve out around the mashed potato, garnishing with herbs: chives, here, parsley or coriander would also work very nicely. Happy new year to all my readers, followers, fans and friends ... actually, you're all friends. It's a new year and I'd like to make the best of the opportunity by asking you guys what you'd like to see, what you'd like to read and which way you'd like to see things progressing. We all know that paleo is quite a loose description, some of us have one view, others, quite another, but we all hang together with something in the middle in mind. Living in the Ice Age is an ancestral focussed food blog. I prepare, eat and enjoy real food, made from real ingredients. In the comments, pop up an idea, a request, a challenge ... I'll do my best to work it in and show you how I'd do it. Also, if you're having difficulties, post up a question ... I'll do my best to help you out.